In June 1840, Edward Eyre led an expedition out of Adelaide with the aim of finding the centre of the Australian continent. Three months later, exhausted and disheartened, he climbed a stony rise to survey the route ahead. What he saw was “the most miserable and melancholy aspect imaginable… the horizon everywhere was one low uninterrupted level, destitute of vegetation and thickly coated over with salt…quite impossible to cross.” In bitter disappointment, he turned from the “dreary and cheerless scene” and retreated southward. Although he didn’t realise it, Eyre was standing in a vast, shallow depression of 1.2 million square kilometres, covering almost one-sixth of Australia across large parts of three states and the Northern Territory. Within this huge basin, at the continent’s lowest point (16 metres below sea level), lies Kati Thanda-Lake Eyre, whose name reflects both its Indigenous and European heritage. 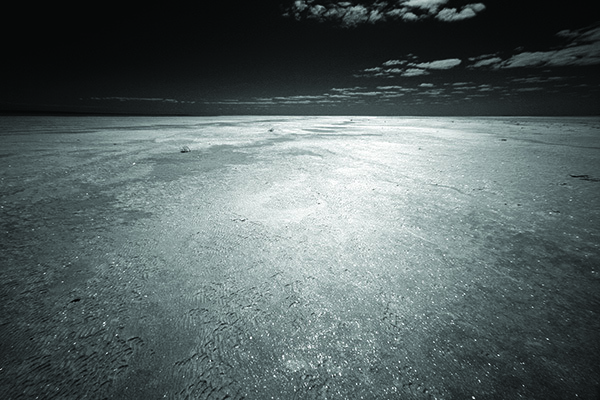 Kati Thanda-Lake Eyre is both a gigantic salina (dry salt lake) and a playa lake that occasionally floods. The contrast between the dry and the wet is astonishing. When it is dry it is the biggest salt pan in the world, devoid of life except for the remarkable Lake Eyre dragon, a highly specialised lizard that lives on the dry lake-bed eating ants and sheltering from the intense heat in the mud layer beneath the salt crust. But, on the rare occasions when Kati Thanda fills with water, it becomes Australia’s largest lake, covering 9700 square kilometres. For a short time the plains are fertile and green, long-dormant marine creatures multiply in the lake’s saline waters and enormous numbers of water birds arrive to feed and raise their young before the waters evaporate once more. The lake exists in two sections—North, 144km long and 65km wide, and South, measuring 65km by 24km, joined by the 15km Goyder Channel. 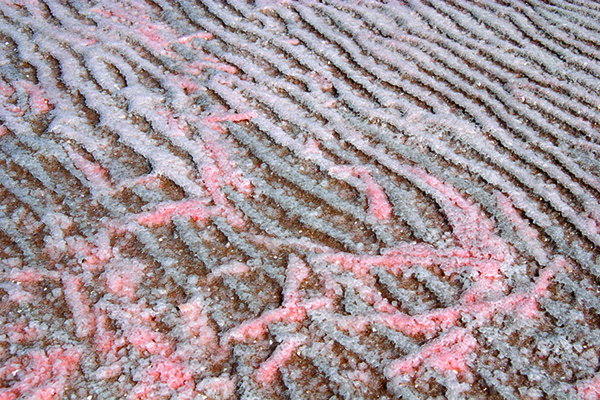 About one-third of the lake, mostly in the southern part, is covered by a hard salt crust about 50cm thick. To the north of this crust is the ‘slush zone’, where a thin layer of salt covers silty, gypsum-rich mud up to 6m deep that never dries. The whole lake bed lies below sea level. 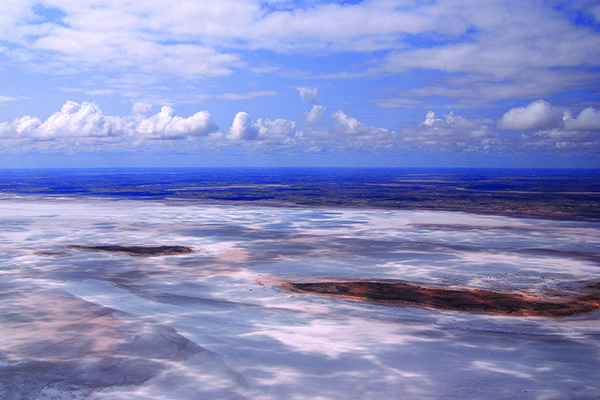 The lowest point varies with the extent of salt crystallisation but is always near the southern margin of Lake Eyre North, averaging about 16m below sea level, in Belt Bay, Jackboot Bay or Madigan Gulf. Kati Thanda-Lake Eyre lies in the most arid part of Australia, surrounded by the Sturt Stony Desert, Tirari Desert and the Strzelecki Desert, where the average annual rainfall is less than 125mm. Although the Basin is one of the world's largest internally draining river catchments, only a tiny fraction of the rain that falls within it reaches the lake. In this shallow, virtually flat depression many rain events only yield enough water to provide sustenance for local plants and animals, top up isolated waterholes and billabongs, and generate minor flows in desiccated channels. 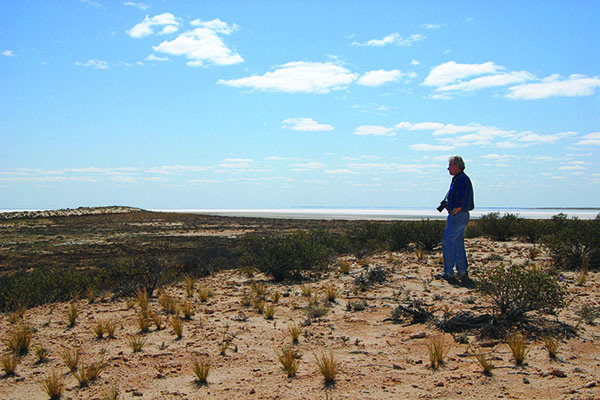 Local rain can flood Kati Thanda–Lake Eyre to four metres, as occurred in 1984 and 1989. In strong La Niña years, intense northern monsoons can cause riverine floods to a depth of one-and-a-half-metres every three years, and a four-metre flood every decade. However, the lake has filled to capacity only three times in the last 150 years, the highest recorded flood level of six metres occurring in 1974. The traditional custodians of the Lake Eyre region are the Arabana Aboriginal people, whose ancestors have lived here for thousands of years. In their language ‘Kati Thanda’ means wetland in the desert, and it plays a central role in many of their Dreaming stories and songs. In May 2012, the Arabana won a 14-year court battle to secure native title over 70,000 square kilometres of South Australia's far north, including the lake and surrounding region. The determination allows unconditional access to the land for hunting, camping, fishing and traditional ceremonies. These rights are non-exclusive and the region will continue as a popular tourist destination, especially when the lake is flooded. The Kati Thanda-Lake Eyre National Park, which includes both sections of the lake and parts of the Tirari Desert, is co-managed by an Advisory Committee, comprising members of the Arabana community and representatives of the South Australian Government. Tourism is increasing rapidly in the Basin and may soon overtake the pastoral industry as the second largest contributor to the economy. In the Kati Thanda-Lake Eyre region, visitor numbers vary from about 5,000 in a dry year to around 25,000 in a flood event year. 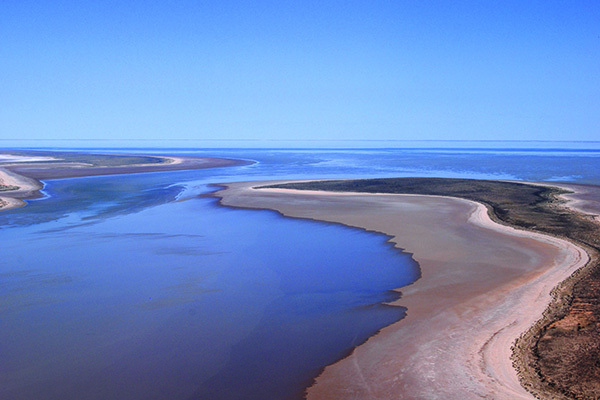 The 64-kilometre Halligan Bay Track begins about seven kilometres south of William Creek, along the Oodnadatta Track, and ends at a campground on the western shore of the northern lake. This is a rough 4WD track and the last ten kilometres involves soft-sand driving. It is suitable only for high-clearance 4WD vehicles and can take up to three hours to cover, depending on conditions. The route passes through the national park and is closed from 1 December to 15 March. Of course, if you take the time and trouble to get all the way out to this remote region, there are several locations where you can savour the experience by camping in its amazing outback environment. Located in the national park, it's the only designated camping area on the lake-shore and, if there is water in the lake, it can feel remarkably like camping at the beach. There are toilets and picnic shelters but otherwise campers need to be totally self-sufficient. 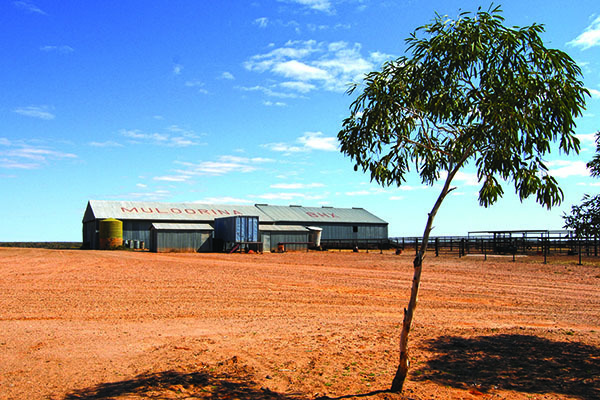 About 130 km west of Marree on the Oodnadatta Track, it was once a station on the old Ghan railway line but now offers shaded camping with amenities that include a natural hot-spring spa, showers, toilets, camel tours (during winter), restored heritage buildings, a small museum and several walks. The permanent wetland is an oasis for wildlife and birdwatching is a well-rewarded pastime here. 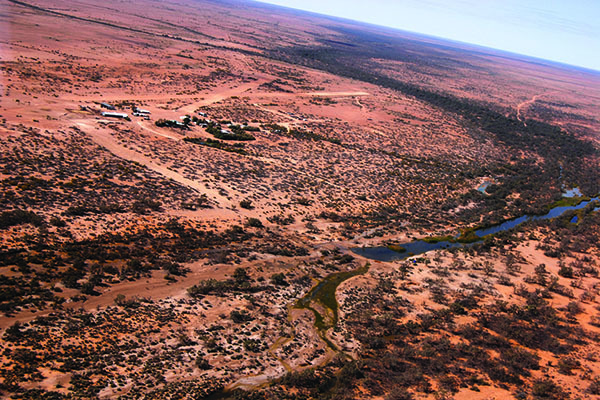 A lazy 48-kilometres north of Marree, occupying 4,000 square kilometres of ‘rangeland’ bordering the shore of the South Lake. In 1964, Sir Donald Campbell and his 500-strong entourage stayed at the property when he set the land speed record (648 km/h) on the dry salt lake in his gas turbine-powered vehicle, Bluebird. The homestead complex provides home-stay accommodation, shearers quarters and camping on the banks of Frome Creek, which runs through the property. The camping area lies along a bore-fed billabong, a pleasant oasis that attracts an array of birdlife. It is suitable for camper trailers and makes a handy staging point for 4WD excursions to the lake, about 25km away. For powered camping or air-conditioned accommodation, there are caravan parks and historic hotels at Maree and William Creek. 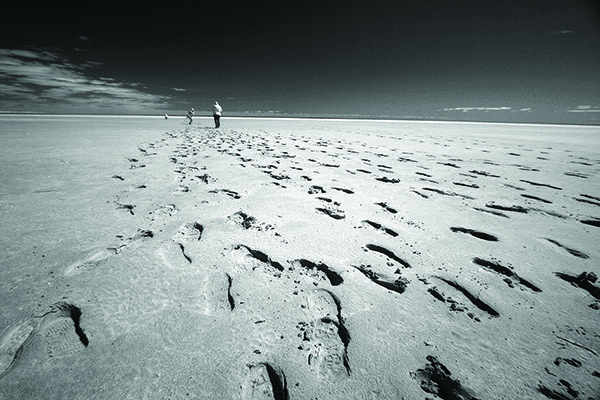 Kati-Thanda-Lake Eyre is a magical place that captures the imagination. During the day, the dazzling white of the salt-pan contrasts starkly with a metallic blue sky. When the lake is full, its flat, unruffled surface reflects the sky in a way that makes the horizon impossible to distinguish. At sunrise and sunset the lake’s smooth surface glows with a pink, opalescent sheen. An eerie atmosphere descends at night, with sibilant breezes, midnight mirages and a landscape that glitters in the moonlight. But the lake’s greatest appeal lies in the overwhelming sense of isolation and personal insignificance one feels when standing on its crystalline shore with nothing visible but a vast, featureless panorama all around—where time and space have no dimension.